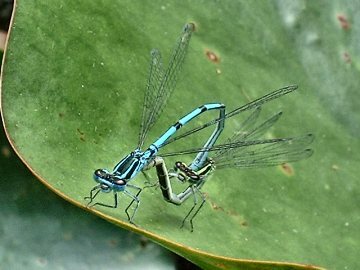 Cokeham Reed Beds (west Lancing) produced the following insects of newsworthy interest: a Ruddy Darter (dragonfly), Azure Damselflies in a mating wheel (image), Comma and Speckled Wood Butterflies. A newt tadpole, with four legs, is seen on the surface of my garden pond in Shoreham town, but it evaded capture for a further look. 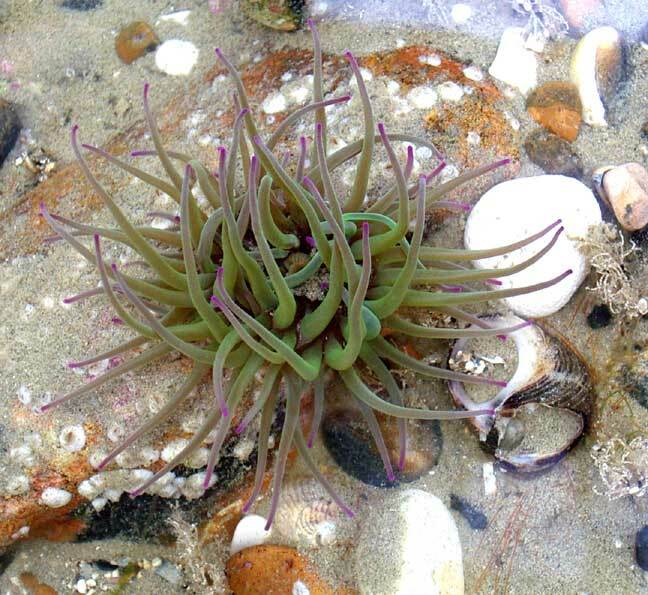 In the pool of water left by the receding tide underneath the middle groyne on Kingston Beach, a Snakelocks Anemone, Anemonia viridis, expanded its stinging tentacles. This anemone is unusual on this shore and reaches its easterly point of distribution on the northern coast of the English Channel at Shoreham. The pools also contained at least half a dozen small first year Corkwing Wrasse, Symphodus melops, which are a month earlier than usual between the tides. 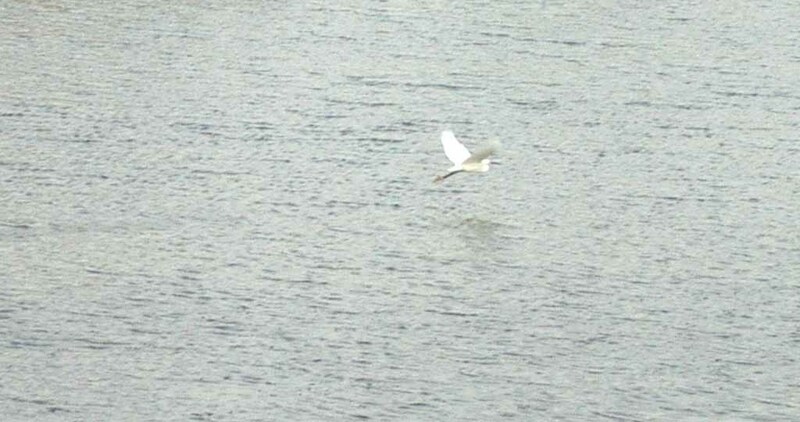 Seven Little Egrets all actively feeding in the shallows of Widewater Lagoon was an unprecedented number as there is usually only one, and rarely more than three. There was another underneath the Footbridge at low tide. The first Emperor Dragonfly of 2004 was spotted majestically flying up and the down the Teville Brook that feeds into Brooklands Boating Lake over the reed-bordered stream open to the public. It had a a very bright pale blue abdomen and looked fresh in the sunshine. 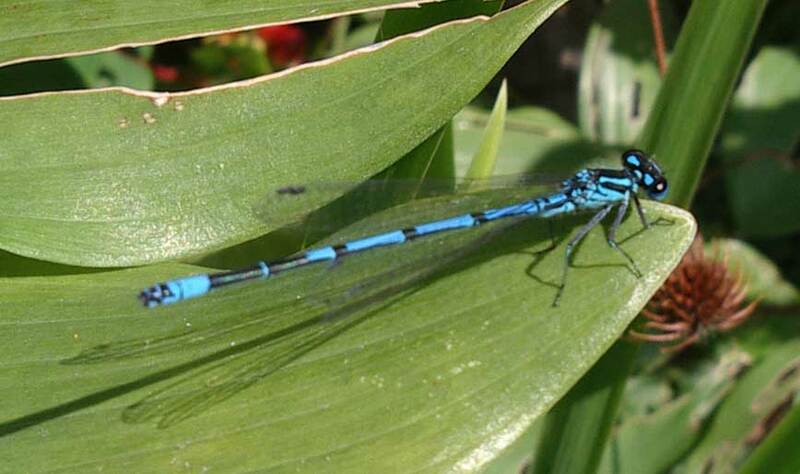 A late Azure Damselfly, Coenagrion puella, was discovered in the pond in my south Lancing garden (TQ 186 044). 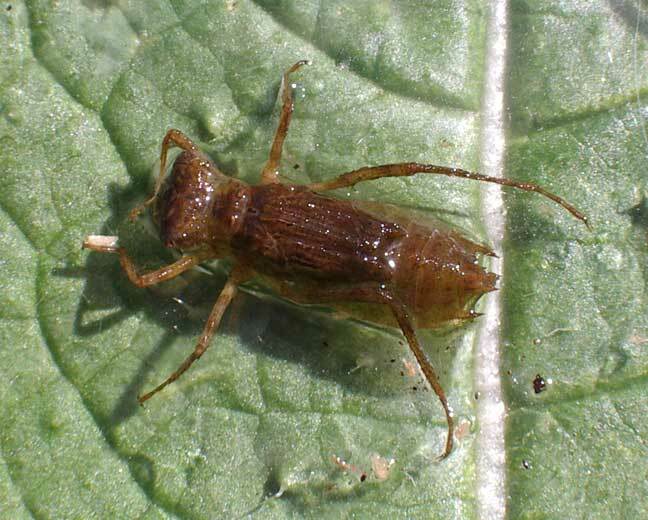 Also, a nymph of a darter dragonfly (photograph above right) is not identified at the time of writing; it is probably the nymph of the Common Darter. One Hummingbird Hawk Moth, Macroglossum stellatarum, my first this year, visited my south Lancing garden (TQ 186 044). A Hummingbird Hawk Moth, Macroglossum stellatarum, makes a repeated visit to the Jasmine in the rear garden of the Buckingham Arms Public House just south of Shoreham railway station. Visits to Mill Hill late in the afternoon always find a reduced tally of butterflies and a quick walk around the lower slopes was no exception with just 35 Chalkhill Blues positively counted on the lower slopes with another five mixed with half a dozen Common Blues on the longer grasses of the upper slopes. It is still a bit early for the Chalkhill Blue emergence. The second and third appearance of Wall Browns this year was the only other notable observation, once on a bramble bush as the trail branches off into the area I have christened the Triangle and the other seen on the path by the reservoir. No Marbled Whites showed. The annual influx of waders to the River Adur estuary begins, some birds will remain for the winter: at least 22 Little Egrets were seen between Widewater and the Cement Works, with 120 waders of eight species: 42 Redshanks, 40 Lapwings, 15 Dunlin, 8 Ringed Plovers, 5 Whimbrel, 5 Common Sandpipers, 4 Turnstones and an Oystercatcher. Rising from the tall shrubbery in the Ravensbourne Avenue garden to the the rear of the back garden of 40 The Drive, (TQ 219 063), a large grey female Sparrowhawk looked menacing as it flew over the garage in a westerly direction and quickly disappeared from the view. This surprising record was the first hawk recorded in this part of town, near Buckingham Park. The noteworthy butterflies were the two Small Blues definitely confirmed at the road embankment at the top of The Drive, Shoreham-by-Sea, of which one was in a clean newish condition and the second one was worn. 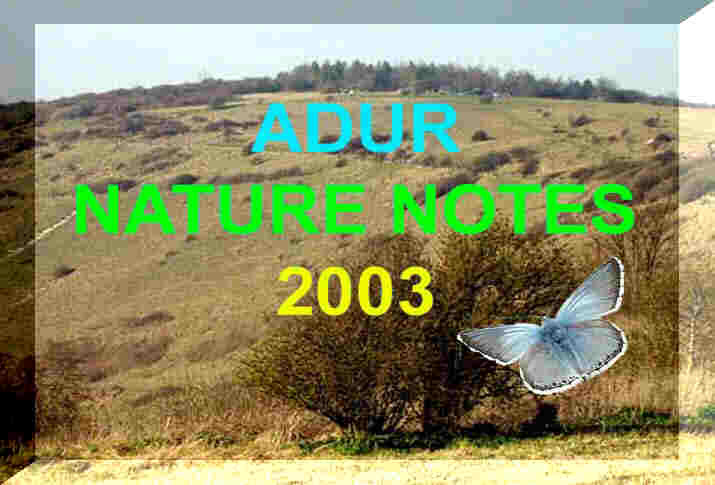 Nine speces of butterfly were seen without leaving the Shoreham town boundaries and urban area. 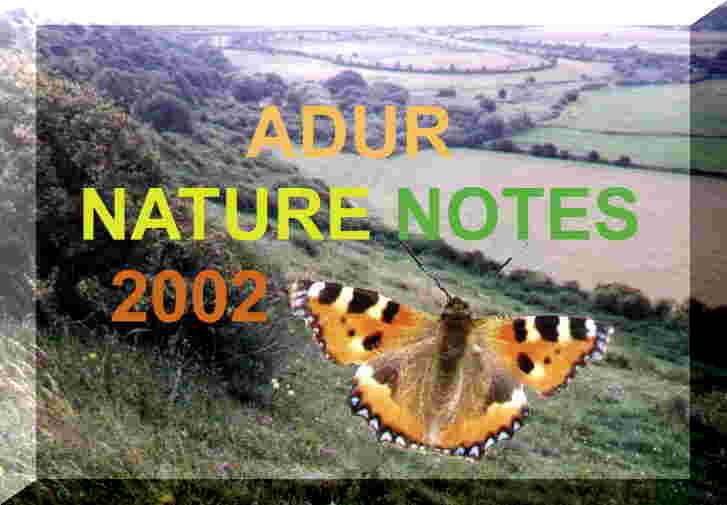 Sixteen species of butterfly were seen in the lower Adur valley in the last week. A steady Moderate Breeze (Force 4) from the south-west were not the ideal conditions for butterflies on the exposed downs. 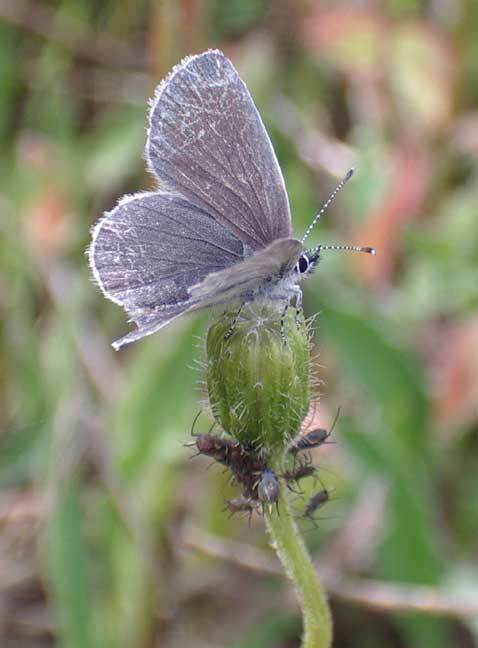 The approximate count of eighty Chalkhill Blue Butterflies (males 79, females 1), all but two on the lower slopes of Mill Hill indicated the peak time was probably still at least a week off. The Common Blue Butterflies were now beginning on the upper meadows with about a dozen fluttering around, but the Marbled Whites were passed their peak with only eight seen in flight amongst the longer grasses on the Mill Hill plateau. 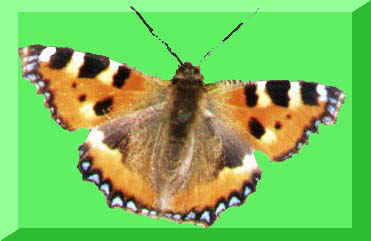 Twelve different species of butterfly were seen around midday. A dozen Common Frogs appeared on the lawn in my south Lancing garden (TQ 186 044) as the first rain fell out of the clouds and the thunder rumbled in the early evening. Approaching midnight the temperature was 20.2 ºC with a humidity of 84% in the still air (Force 1). It was very sticky and humid. 3-spined Sticklebacks are much handsomer than the 10-spined Sticklebacks, especially when the larger of the two freshwater native species are in their breeding colours, in a stream by an Oak Tree next to the South Links cyclepath north of Botolphs. This area is known as the Saltings Field. 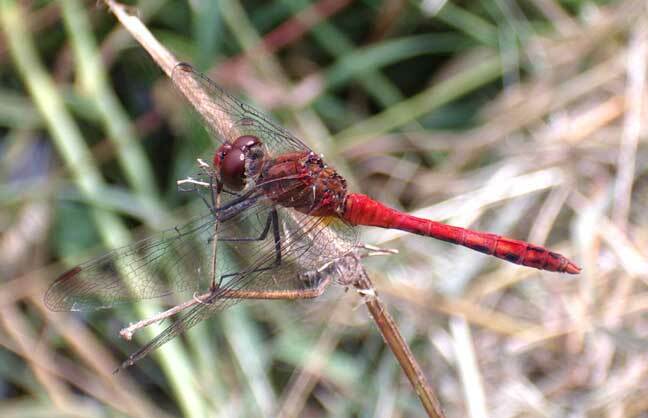 This was the first record of a male Ruddy Darter, Sympetrum sanguineum, on these Nature Notes pages from this stream. This dragonfly has been overlooked before and mistaken for a Common Darter. Very early in the morning at Steep Down (NW of Lancing Clump) a Little Owl was seen perching on a telegraph pole. A couple of Chalkhill Blues were seen on Southwick Hill. Management of Widewater Lagoon Nature Reserve is undertaken by the Widewater Management Committee who meant to discuss aspects relating to the operation of the pipeline and other environmental issues. The full minutes of the meeting held in the afternoon will be available on a web page later for public scrutiny. The operational committee consists of representatives from West Sussex County Council Rural Strategy Unit (the Chairman is Neil Mitchell), Lancing Parish Council (principal land owners), Friends of Widewater Lagoon (FOWL, representing the interest of local resident groups), Shoreham & District Ornithological Society and Adur Valley Biodiversity Network. The sudden appearance of a Peacock Butterfly was a bit if a surprise, in the narrow field next to the stream by the Steyning Road (TQ 209 068). The large accumulation of fungi on a rotten log on the cyclepath north of Old Shoreham, by the road layby, was less so. 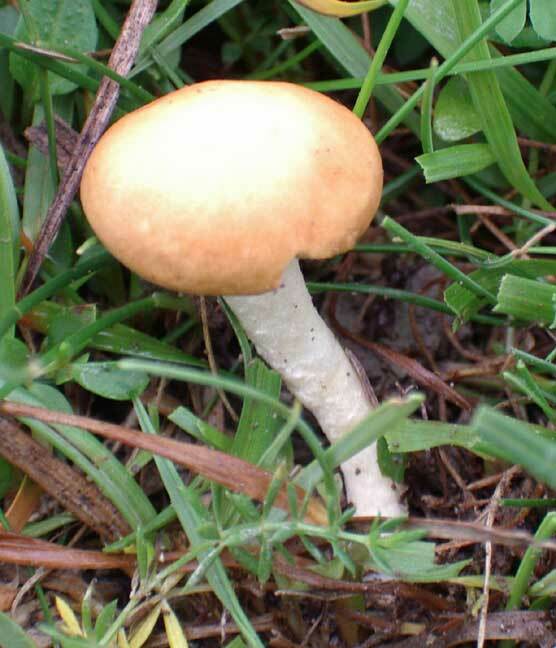 The suggested species is Agrocybe aegerita (= cylindracea). This species is edible but the mushrooms on the wood did not look very appetising. In the scrub and on the road embankments and amongst the Hawthorn and Bramble bushes of Mill Hill, Gatekeeper Butterflies were the commonest species around with over a hundred. Chalkhill Blues were now appearing in dribs and drabs with 32 males and one female counted. Just three males were on the upper slopes and the rest on the lower slopes. This is contrast to Marbled Whites which prefer the longer grass with 20 counted on the upper slopes and just two flying over the hedgerows on the lower slopes. There were thirteen different species of butterfly in just over two hours. There were over 40 Six-spot Burnet Moths on Mill Hill. 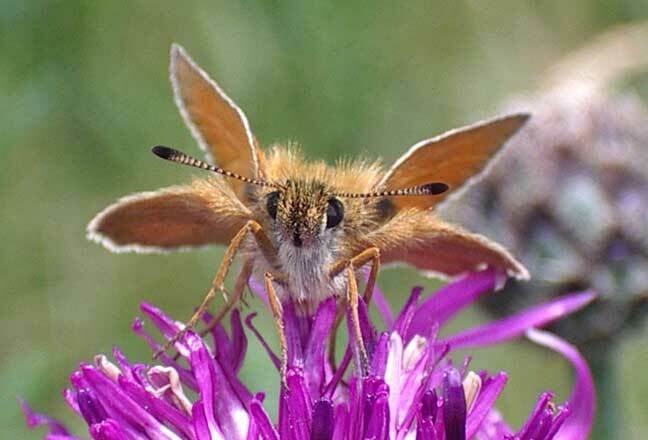 The smaller Skippers were plentiful and I still do not know if these are the Small or Essex Skippers? As the sun struggled to come out, so did the flying insects: hoverflies (at least five species) and butterflies (eight species in Shoreham town) in their dozens and scores, with bumblebees (three species), ladybirds (one species) and a few bees and wasps as well. This was just in one garden and a twenty minute detour along the road embankment of Slonk Hill South which showed all the eight species, and probably more if I had time to search. The highlights were a completely unexpected Small Blue (the first recorded in July) and a pale coloured Gatekeeper. The most numerous butterflies were the normal bright orange Gatekeepers and Small/Essex Skippers with numbers seen around midday over 40 each and many more hiding in the longer grasses. 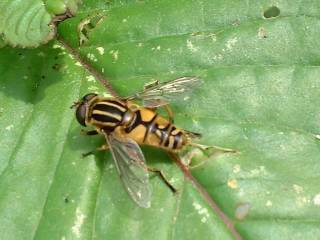 The colourful species of hoverfly known as Helophilus pendulus appeared in my south Lancing garden (TQ 186 044) on a thundery day. This hoverfly appears to have an affinity for the garden pond and readily alighted on the Brooklime emerging from the shallows. A male Black-headed Bunting, Emberiza melanocephala, appeared in my garden near Mill Hill, Old Shoreham in the morning. This yellow-breasted bird with a black head is a rare vagrant from the eastern Mediterranean Sea area where it is common. NB: This does look like a bird I saw on 2 June 2003 and again in July 2003 in dense bushes near the horse's field south-west of the bridge, eventually identified as a Yellowhammer (although subsequent Yellowhammers have looked nothing like it). 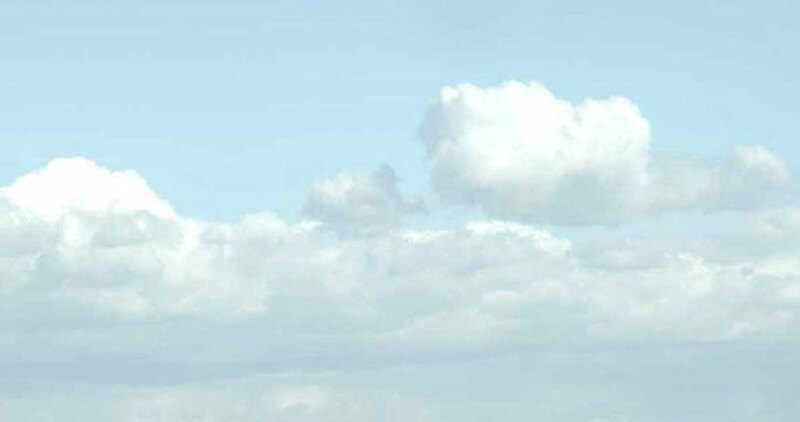 Half a dozen Swifts put on an acrobatic display over the ridge of Mill Hill. On the lower slopes 8+ Chalkhill Blue Butterflies were my first of this year. Altogether there were 15 Marbled White Butterflies counted on the downs, but more are expected to be hiding in the long grasses and common meadow plants. More butterflies and moths, bumblebees, hoverflies and other flying bugs were all out in their hundreds. Two fresh Comma Butterflies were seen at Malthouse Meadows, Sompting with other species. There was a small unidentified mushroom in the grass by the path in the dog mess zone on the lower slopes of Mill Hill. The Fish Festival display at Shoreham Harbour included a Triggerfish, Balistes capriscus, caught off Sussex the previous day, with a handful of other fish including Bass, two Stingrays, a Nursehound, Atlantic Eels, Corkwing Wrasse, Undulate Rays, one large Plaice and some invertebrate life with crustaceans that included Lobsters, Spiny Spider Crabs, Velvet Swimming Crabs, Common Hermit Crabs, Shore Crabs and molluscs including live Scallops. 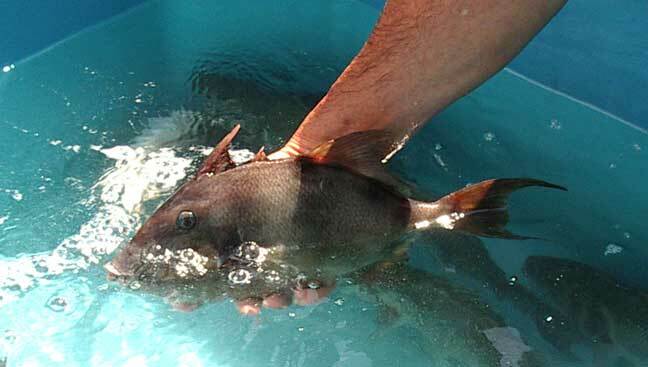 The Triggerfish (photographed above) swam around occasionally rising to the surface and expelling water from its mouth. It did not appear to be in discomfort and looked in a healthy condition. At just after nine in the morning a single Peregrine Falcon flew around the Power Station Chimney and there were hundreds of Moon Jellyfish, Aurelia aurita, in the canal section of the harbour. 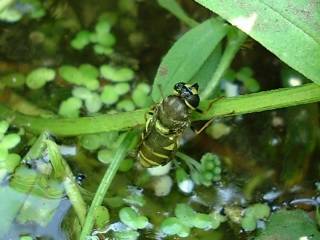 My south Lancing garden pond (TQ 186 044) has been home to the larval form of a soldier fly, Stratiomys potamida. I recently witnessed as one of three to have emerged, hauled itself out, unfolded it's wings and sat in the sun to prepare for the next stage of its life. This species is nationally rare, although it could be under-recorded. It could be mistaken for a hoverfly, but this fly has longer antennae than most hoverflies. 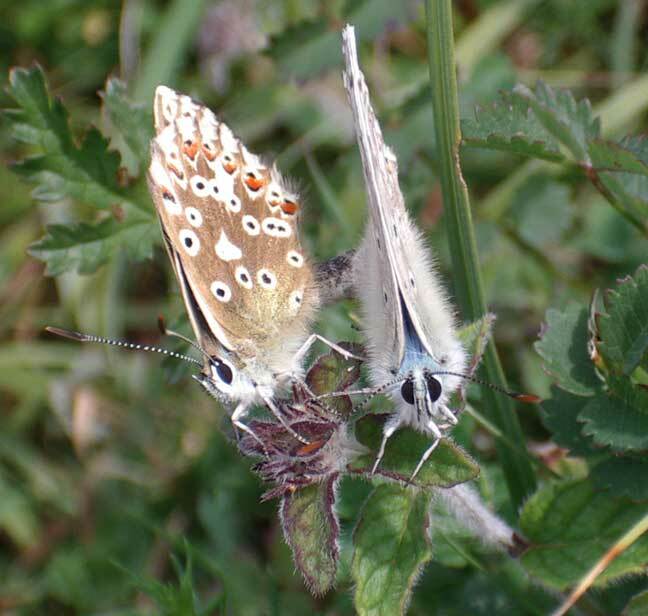 The first Chalkhill Blue Butterflies of 2004 are seen on Mill Hill. Two blues emerged in the morning. Two Peregrine Falcons sparred over the top of the power station in Shoreham Harbour at 9:00 am on an overcast morning in a gap between the rain showers. They appeared from behind the chimney where the nest box faces south and chased each other over the main power station building landing on the roof between their spars. The rain started at about 2:00 pm and the cracks of thunder and sheet lightning later in the afternoon. 26.42 mm (just over an inch) of rain fell in about six hours. 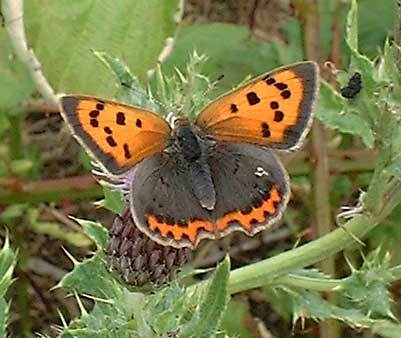 The first Small Copper Butterfly of the year was discovered on Malthouse Meadows, Sompting, with five other species of butterfly. 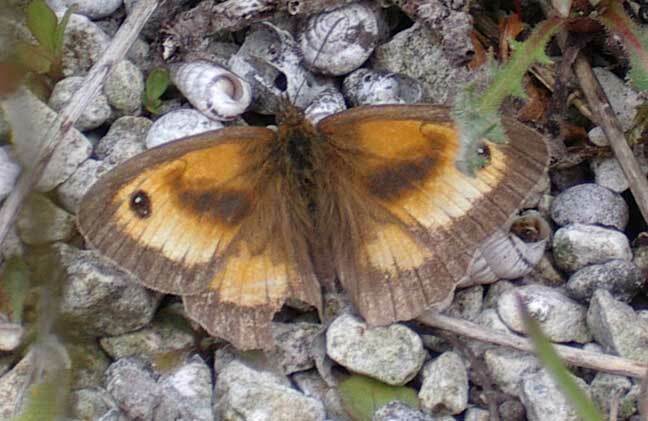 The first Gatekeeper Butterfly of 2004 was seen on the A27 road embankment north of Buckingham Park. 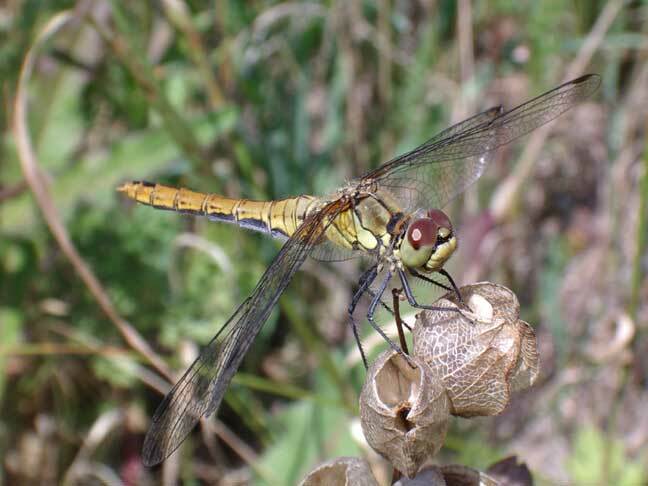 This area also hosted my first female Ruddy Darter Dragonfly, Sympetrum sanguineum, but this was mistaken for a Common Darter and not identified until 3 August 2004. And the first second brood Holly Blue Butterfly visited a garden in Shoreham. 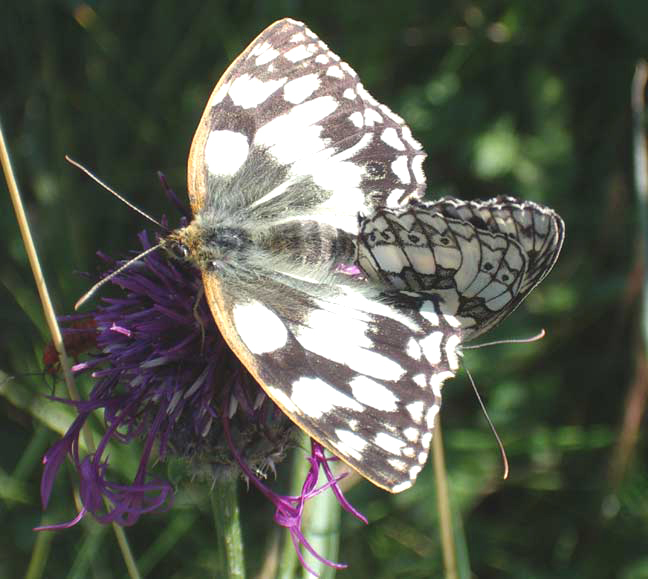 Marbled White Butterflies were mating on Mill Hill. Altogether I saw 10 species of butterfly on the day. With Ray Hamblett's species this was 13. There was one Australian Black Swan with about twenty five Mute Swans on the River Adur between the Railway Viaduct and the Toll Bridge. 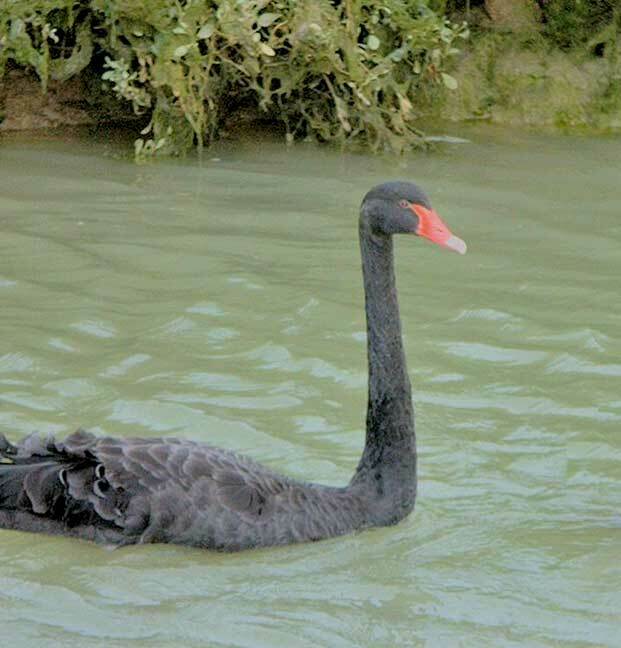 There was an Australian Black Swan in the mouth of the River Adur estuary. 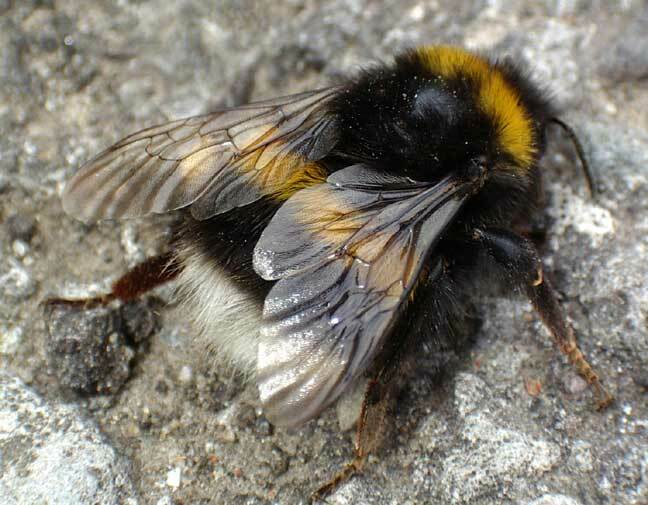 This is my first bumblebee of July 2004, and there are plenty of bumblebees around. It was on the path outside my front garden in Shoreham town. Bumblebees are attracted to Hebe in its various forms at this time of the years, as many as thirty bumblebees of three different species with hoverflies around a single shrub.